[S58] Index to Texas Birth Records (Austin, Tex. : Tex. Dept. of Health, Bur. of Vital Statistics), typescript 1941, vol. 2, p. 772, file 102419. [S190] Navarro County Cemetery Records, vol. 10 (Corsicana, Tex. : The Navarro County Gen. Soc'y, 1990), p. 32 (giving his middle name as Davis). [S190] Navarro County Cemetery Records, vol. 10, above, p. 32. Other Names*: Floy Tate, Florence Mallory, Floy Mallory, Florence Malloy, Floy Malloy. [S167] Anvaline Provence, letter to Theretta Pickel, undated (copy obtained 26 May 1974 by Roger Bartlett from Ann McFadin Miller, Corpus Christi, Texas) (quoting 4 Dec 1907 letter from Emmeline Bartlett Tate to Anvaline Meredith Provence). [S1080] 1870 U.S. Census, Denton County, Texas, p. 33, dwelling 244, family 252 (stating that she twenty-three years old on 1 Jun 1870 and was born in Texas). [S1074] 1880 U.S. Census, Navarro County, Texas, p. 10, dwelling 85, family 90 (stating that she was twenty-four years old on 1 Jun 1880 and was born in Texas). [S7] Navarro County, Texas Marriages, vol. 1, 1846-1888 (Corsicana, Tex. : The Navarro County Gen. Soc'y, 1987), p. 30 (citing Navarro County, Texas Marriage Records, vol. II, p. 164) (giving their names as S. T. Malloy and Floy Tate). [S7] Navarro County, Texas Marriages, vol. 1, 1846-1888, above, p. 30 (citing Navarro County, Texas Marriage Records, vol. II, p. 164) (giving her name as Floy Tate and his as S. T. Malloy). [S189] Navarro County Cemetery Records, vol. 9 (Corsicana, Tex. : The Navarro County Gen. Soc'y, 1989), p. 86 (giving the date but not the place). [S1074] 1880 U.S. Census, Navarro County, Texas, p. 10, dwelling 85, family 90 (stating that he was born in 1848 or 1849 in Georgia). [S1074] 1880 U.S. Census, Navarro County, Texas, p. 10, dwelling 85, family 90. Nimrod Williams's tombstone, Williams Cemetery, Brentwood, Tenn., courtesy of Penny Duncan. • A Find A Grave memorial for Nimrod Williams is here. [S423] Robert Williams, electronic mail to Roger Bartlett, 12 Jul 1998, (naming Daniel Williams as his father). [S461] Jerry A. Simpson, Tyler, Tex., computer file sent to Roger Bartlett, 21 Mar 1999, (naming Daniel Williams as his father). 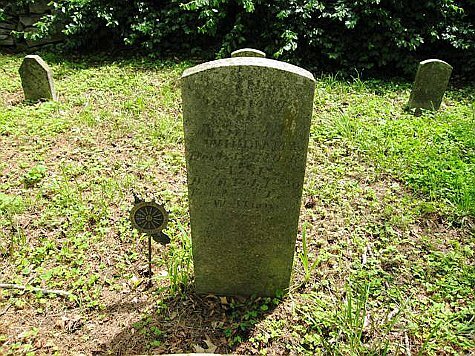 [S611] Will of Daniel Williams Sr., 16 Apr 1793, online http://searches1.rootsweb.com/usgenweb/archives/tn/davidson/…, attributed to Will Book 1, p. 32, Davidson County, Tenn., downloaded 18 Mar 2001, (naming Nimrod Williams as the son of Daniel Williams, Sr.). [S461] Jerry A. Simpson, 23 Mar 1999 computer files, above, (naming _____ Echols as his mother). [S423] Robert Williams, electronic mail to Roger Bartlett, 12 Jul 1998, (giving only the year and not naming the place). [S461] Jerry A. Simpson, 23 Mar 1999 computer files, above. [S722] Richard Carlton Fulcher, comp., 1770-1790 Census of the Cumberland Settlements: Davidson, Sumner and Tennessee Counties (In What Is Now Tennessee) (Baltimore, Md. : Genealogical Publishing Co., Inc., 1987), p. 131 (stating that he was born in Laurens District, South Carolina in 1750). [S430] Bessie Lee Bartlett Buchanan, Wichita Falls, Tex., "D.A.R. Ancestral Chart," handwritten, undated, copy in possession of Roger Bartlett, (not giving the date). [S722] Richard Carlton Fulcher, comp., 1770-1790 Census of the Cumberland Settlements [etc. ], above, p. 131. [S610] Williams Cemetery, Davidson County, Tennessee, online at ftp://ftp.rootsweb.com/pub/usgenweb/tn/davidson/cemeteries/williams.txt, viewed on 17 Mar 2001, (stating that he died in Feb 1820 and not naming the place). [S722] Richard Carlton Fulcher, comp., 1770-1790 Census of the Cumberland Settlements [etc. ], above, p. 131 (stating that he died in Davidson Coiunty, Tennessee in Feb 1820). [S961] Find A Grave, online at http://www.findagrave.com, memorial for Nimrod Williams, memorial no. 23099838, viewed on 22 Aug 2011 (stating that he died in Feb 1820 without naming the place). [S961] Find A Grave, online, above, memorial for Nimrod Williams, memorial no. 23099838, viewed on 22 Aug 2011. [S610] Williams Cemetery, Davidson County, Tennessee, online, above. [S461] Jerry A. Simpson, 23 Mar 1999 computer files, above, (naming Nimrod Williams as her father). [S168] Bess Bartlett Buchanan, miscellaneous papers, above, (chart of Nimrod Williams's descendants, provided by Garrett B. Drummond, Jr. to Roger Bartlett 28 Jun 1973, naming Nimrod Williams as her father). [S430] Bessie Lee Bartlett Buchanan, Wichita Falls, Tex., "D.A.R. Ancestral Chart," above, (naming Nimrod Williams as her father). [S722] Richard Carlton Fulcher, comp., 1770-1790 Census of the Cumberland Settlements [etc. ], above, p. 131 (naming Nimrod Williams as her father). [S623] Cynthia Jones Reese, e-mail address, chart of descendants of Anthony Hampton and Mary Ann Williams sent to Roger Bartlett, 25 April 2001,(naming Nimrod Williams as her father). [S722] Richard Carlton Fulcher, comp., 1770-1790 Census of the Cumberland Settlements [etc. ], above, p. 131 (giving her name as Mary and naming Nimrod Williams as her father). [S168] Bess Bartlett Buchanan, miscellaneous papers, above, (chart of Nimrod Williams's descendants, provided by Garrett B. Drummond, Jr. to Roger Bartlett 28 Jun 1973, naming Nimrod Williams as this child's father). [S423] Robert Williams, electronic mail to Roger Bartlett, 12 Jul 1998, (naming Nimrod Williams as this child's father). [S461] Jerry A. Simpson, 23 Mar 1999 computer files, above, (naming Nimrod Williams as his father). [S722] Richard Carlton Fulcher, comp., 1770-1790 Census of the Cumberland Settlements [etc. ], above, p. 131 (naming Nimrod Williams as his father). [S461] Jerry A. Simpson, Tyler, Tex., computer file sent to Roger Bartlett, 21 Mar 1999, (naming David Griffin as her father). [S461] Jerry A. Simpson, 23 Mar 1999 computer files, above, (naming Susan Garnett as her mother). [S722] Richard Carlton Fulcher, comp., 1770-1790 Census of the Cumberland Settlements: Davidson, Sumner and Tennessee Counties (In What Is Now Tennessee) (Baltimore, Md. : Genealogical Publishing Co., Inc., 1987), p. 131. [S610] Williams Cemetery, Davidson County, Tennessee, online at ftp://ftp.rootsweb.com/pub/usgenweb/tn/davidson/cemeteries/williams.txt, viewed on 17 Mar 2001, (stating that she died in 1811 and not naming the place). [S722] Richard Carlton Fulcher, comp., 1770-1790 Census of the Cumberland Settlements [etc. ], above, p. 131 (giving only the date). [S168] Bess Bartlett Buchanan, Wichita Falls, Tex., miscellaneous papers, (chart of Nimrod Williams's descendants, provided by Garrett B. Drummond, Jr. to Roger Bartlett 28 Jun 1973, naming Christiana Griffin as her mother). Copies of these papers were provided by Garrett B. Drummond, Jr., 567 South L St., Livermore, Calif. 94550, to Roger Bartlett in June 1973. [S623] Cynthia Jones Reese, e-mail address, chart of descendants of Anthony Hampton and Mary Ann Williams sent to Roger Bartlett, 25 April 2001,(naming Christina Griffin as her mother). [S722] Richard Carlton Fulcher, comp., 1770-1790 Census of the Cumberland Settlements: Davidson, Sumner and Tennessee Counties (In What Is Now Tennessee) (Baltimore, Md. : Genealogical Publishing Co., Inc., 1987), p. 131 (giving her name as Mary and naming Nimrod Williams as her father). [S623] Cynthia Jones Reese, chart of descendants of Anthony Hampton and Mary Ann Williams, above,(naming Christina Griffin as her mother). [S168] Bess Bartlett Buchanan, miscellaneous papers, above, (chart of Nimrod Williams's descendants, provided by Garrett B. Drummond, Jr. to Roger Bartlett 28 Jun 1973) (giving only the year and not naming the place). [S722] Richard Carlton Fulcher, comp., 1770-1790 Census of the Cumberland Settlements [etc. ], above, p. 131 (giving her name as Mary and giving the date but not naming the place). [S168] Bess Bartlett Buchanan, miscellaneous papers, above, (chart of Nimrod Williams's descendants, provided by Garrett B. Drummond, Jr. to Roger Bartlett 28 Jun 1973) (not giving the place or date). [S722] Richard Carlton Fulcher, comp., 1770-1790 Census of the Cumberland Settlements [etc. ], above, p. 131 (not giving the date or place). [S623] Cynthia Jones Reese, chart of descendants of Anthony Hampton and Mary Ann Williams, above,(giving only the year). [S168] Bess Bartlett Buchanan, Wichita Falls, Tex., miscellaneous papers, (chart of Nimrod Williams's descendants, provided by Garrett B. Drummond, Jr. to Roger Bartlett 28 Jun 1973, naming Capt. Edward Hampton as his father). Copies of these papers were provided by Garrett B. Drummond, Jr., 567 South L St., Livermore, Calif. 94550, to Roger Bartlett in June 1973. [S722] Richard Carlton Fulcher, comp., 1770-1790 Census of the Cumberland Settlements: Davidson, Sumner and Tennessee Counties (In What Is Now Tennessee) (Baltimore, Md. : Genealogical Publishing Co., Inc., 1987), p. 131 (not giving the date or place). [S623] Cynthia Jones Reese, chart of descendants of Anthony Hampton and Mary Ann Williams, above,(naming Anthony Hampton as her father). [S168] Bess Bartlett Buchanan, miscellaneous papers, above, (chart of Nimrod Williams's descendants, provided by Garrett B. Drummond, Jr. to Roger Bartlett 28 Jun 1973, naming Anthony Hampton as her father). [S168] Bess Bartlett Buchanan, Wichita Falls, Tex., miscellaneous papers, (chart of Nimrod Williams's descendants, provided by Garrett B. Drummond, Jr. to Roger Bartlett 28 Jun 1973). Copies of these papers were provided by Garrett B. Drummond, Jr., 567 South L St., Livermore, Calif. 94550, to Roger Bartlett in June 1973. [S168] Bess Bartlett Buchanan, miscellaneous papers, above, (chart of Nimrod Williams's descendants, provided by Garrett B. Drummond, Jr. to Roger Bartlett 28 Jun 1973, naming Capt. Edward Hampton as his father). Marriage*: She married Capt. Edward Hampton. [S423] Robert Williams, electronic mail to Roger Bartlett, 12 Jul 1998, (giving only the year). [S168] Bess Bartlett Buchanan, miscellaneous papers, above, (chart of Nimrod Williams's descendants). [S722] Richard Carlton Fulcher, comp., 1770-1790 Census of the Cumberland Settlements [etc. ], above, p. 131 (not giving the date). [S168] Bess Bartlett Buchanan, miscellaneous papers, above, (chart of Nimrod Williams's descendants, provided by Garrett B. Drummond, Jr. to Roger Bartlett 28 Jun 1973, naming Mary Andrews as this child's mother). [S168] Bess Bartlett Buchanan, Wichita Falls, Tex., miscellaneous papers, (chart of Nimrod Williams's descendants, provided by Garrett B. Drummond, Jr. to Roger Bartlett 28 Jun 1973, naming Nimrod Williams as this child's father). Copies of these papers were provided by Garrett B. Drummond, Jr., 567 South L St., Livermore, Calif. 94550, to Roger Bartlett in June 1973. [S461] Jerry A. Simpson, Tyler, Tex., computer file sent to Roger Bartlett, 21 Mar 1999, (naming Nimrod Williams as his father). [S722] Richard Carlton Fulcher, comp., 1770-1790 Census of the Cumberland Settlements: Davidson, Sumner and Tennessee Counties (In What Is Now Tennessee) (Baltimore, Md. : Genealogical Publishing Co., Inc., 1987), p. 131 (naming Nimrod Williams as his father). [S423] Robert Williams, electronic mail to Roger Bartlett, 12 Jul 1998. [S461] Jerry A. Simpson, 23 Mar 1999 computer files, above, (giving only the date). [S610] Williams Cemetery, Davidson County, Tennessee, online at ftp://ftp.rootsweb.com/pub/usgenweb/tn/davidson/cemeteries/williams.txt, viewed on 17 Mar 2001, (giving only the date). [S722] Richard Carlton Fulcher, comp., 1770-1790 Census of the Cumberland Settlements [etc. ], above, p. 131 (giving the date but not naming the place). [S610] Williams Cemetery, Davidson County, Tennessee, online, above, (quoting from portion of 13 Jan 1880 will of Turner Williams that leaves a grave yard to sons James S. Williams and John C. Williams "to be held and used as a family burying ground forever"). [S168] Bess Bartlett Buchanan, Wichita Falls, Tex., miscellaneous papers, (chart of Nimrod Williams's descendants, provided by Garrett B. Drummond, Jr. to Roger Bartlett 28 Jun 1973, naming Anthony Hampton as her father). Copies of these papers were provided by Garrett B. Drummond, Jr., 567 South L St., Livermore, Calif. 94550, to Roger Bartlett in June 1973. [S168] Bess Bartlett Buchanan, miscellaneous papers, above, (chart of Nimrod Williams's descendants, provided by Garrett B. Drummond, Jr. to Roger Bartlett 28 Jun 1973). [S168] Bess Bartlett Buchanan, miscellaneous papers, above, (chart of Nimrod Williams's descendants, provided by Garrett B. Drummond, Jr. to Roger Bartlett 28 Jun 1973, naming Mary Ann Hampton as his mother). [S168] Bess Bartlett Buchanan, miscellaneous papers, above, (chart of Nimrod Williams's descendants, provided by Garrett B. Drummond, Jr. to Roger Bartlett 28 Jun 1973, naming Mary Ann Hampton as her mother). [S168] Bess Bartlett Buchanan, miscellaneous papers, above, (chart of Nimrod Williams's descendants, provided by Garrett B. Drummond, Jr. to Roger Bartlett 28 Jun 1973, naming Dr. G. L. Martin as his father). [S168] Bess Bartlett Buchanan, Wichita Falls, Tex., miscellaneous papers, (chart of Nimrod Williams's descendants, provided by Garrett B. Drummond, Jr. to Roger Bartlett 28 Jun 1973, naming Dr. G. L. Martin as his father). Copies of these papers were provided by Garrett B. Drummond, Jr., 567 South L St., Livermore, Calif. 94550, to Roger Bartlett in June 1973. [S168] Bess Bartlett Buchanan, Wichita Falls, Tex., miscellaneous papers, (chart of Nimrod Williams's descendants, provided by Garrett B. Drummond, Jr. to Roger Bartlett 28 Jun 1973, naming Dr. G. L. Martin as her father). Copies of these papers were provided by Garrett B. Drummond, Jr., 567 South L St., Livermore, Calif. 94550, to Roger Bartlett in June 1973. [S7] Navarro County, Texas Marriages, vol. 1, 1846-1888 (Corsicana, Tex. : The Navarro County Gen. Soc'y, 1987), p. 80 (citing Navarro County, Texas Marriage Records, vol. IV, p. 505). [S498] Vena Bob Gates, Julie Terry, & Ralph Terry, comps., Coleman County Cemetery Inscriptions, vol. 1, above, p. 163 (giving only the year and not naming the place). [S1090] Ann Marcy, electronic mail to Roger Bartlett, 17 Jun 2006 attributing some information to a November 1926 story in the Abilene News. • Pictures and information on "Hodge Oaks," the family's surviving 1860 home near Chatfield, Texas, are on the Navarro County Genealogical and Historical Web Site here. [S153] Navarro County Cemetery Records, vol. 3 (Corsicana, Tex. : The Navarro County Gen. Soc'y, 1984), p. 32 (date only). [S166] 1880 U.S. Census, Navarro County, Texas, enumeration dist. 129, p. 42, family 13 (place). [S153] Navarro County Cemetery Records, vol. 3, above, p. 32 (month unclear; may be Jun). [S153] Navarro County Cemetery Records, vol. 3, above, p. 24 (identifying her as daughter of Robert Hodge). 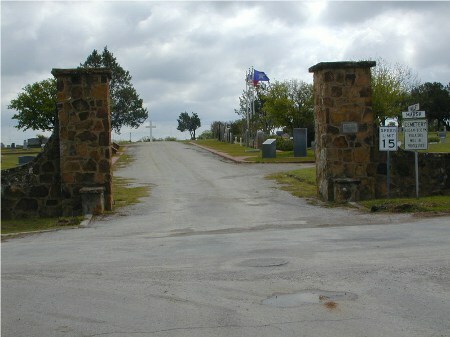 [S153] Navarro County Cemetery Records, vol. 3, above, p. 24 (identifying him as son of Robert Hodge). 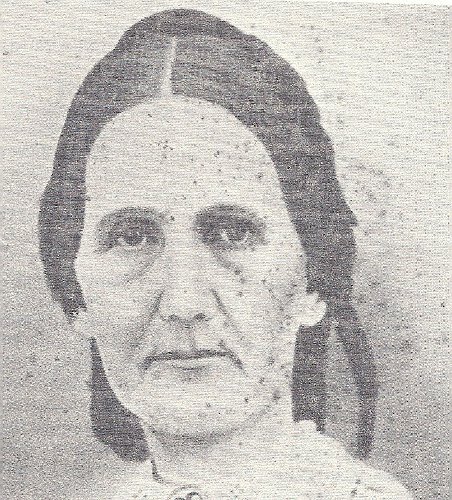 Elizabeth Williams Person Hodge, from Navarro County History, vol. 6, p. 55. [S153] Navarro County Cemetery Records, vol. 3, above, p. 24 (identifying her as daughter of E. W. Hodge). [S153] Navarro County Cemetery Records, vol. 3, above, p. 24 (identifying him as son of E. W. Hodge). Benjamin Franklin Lisman's joint tombstone, Old Cemetery, Chatfield, Tex., courtesy of "timcdfw" on Find A Grave. Other Names*: B. F. Lisman, Benjamin Lisman. "A Resident Here for Many Years and Former County Official. "Capt. B. F. Lisman, a native of Kentucky, but a resident of this county for more than half a century, died at the home of his son-in-law, J. H. Clayton, 1516 West Fifth avenue, this morning at 2:30 at the advanced age of 87 years, 4 months and 8 days. The funeral services will be held at the home tomorrow morning at 8 o’clock, conducted by Rev. Abe Mulkey, after which the body will be taken to Chatfield where interment will take place under the direction of the Masons, of which fraternity the deceased had been for many years an honored member. "The deceased was at one time the tax assessor of Navarro county, was a Confederate veteran, and a man who was held in the highest esteem by all who knew him. 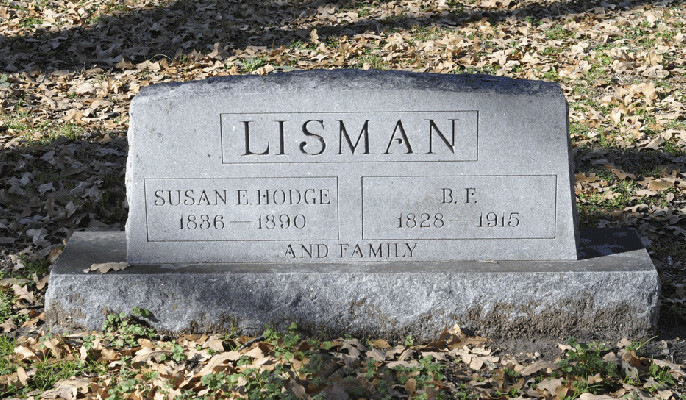 "Another of our pioneer citizens was the Lisman family. B. F. Lisman and family moved to Navarro County around 1855. They decided to settle near Chatfield, a small village in the north eastern part of Navarro County. Mr. Lisman was a blacksmith by trade and had the reputation of being one of the best in the state in making knives, scissors, swords, etc. Mr. Lisman's reputation was so great that he was excused from service in the army during the years of the Civil War so he could make swords and sabers, badly needed by the soldiers leaving Navarro County. Mrs. Joe Clayton of Corsicana, a daughter of the Lismans, had a letter in her possession from the quartermaster saying the Lisman saber was the best they had ever seen. One of the Lisman sabers was made especially for Captain marion Martin of Wadesville, Texas, a few miles south of Chatfield. martin was a captain of the Bass Regiment of Texas. This saber was in the possession of his son, Marion Martin, Jr., Mr. Lisman took silver dollars, melted them and moulded them into the saber handle. He also used some of the silver to decorate the leather scabbard. Beside being a blacksmith, Lisman was the postmaster during the Civil War. After the war was over, Chatfield was called Mesquite by the Federal troops, but when the troops moved away in 1871 the citizens changed the name back to Chatfield, which is what it has been called to the present day." Note*: • In the 1880 U.S. census his occupation was given as blacksmith. • He was tax assessor of Navarro County, Texas and was "a man who was held in the highest esteem by all who knew him." He was survived by his wife, five grandchildren, and six great-grandchildren. [S1207] Corsicana Daily Sun, Corsicana, Tex., online archive at http://corsicana.newspaperarchive.com, 14 May 1915, p. 4, col. 5 (obituary of Capt. B. F. Lisman) (stating that he was a native of Kentucky; not giving the date but stating that he was eighty-seven years, four months, and eight days old when he died on 14 May 1915). [S961] Find A Grave, online at http://www.findagrave.com, memorial for Benjamin Franklin Lisman, memorial no. 69614984, viewed on 25 May 2015 (giving the year but no other information). [S67] The Dallas Morning News, Dallas, Tex., 15 Dec 1889, p. 3 (obituary of Mrs. Susan Lisman) (identifying her as Mrs. B. F. Lisman). [S961] Find A Grave, online, above, memorial for Benjamin Franklin Lisman, memorial no. 69614984, viewed on 25 May 2015. [S961] Find A Grave, online, above, memorial for Susan E. Hodge Lisman, memorial no. 69615012, viewed on 25 May 2015. [S204] Records of Bank Sutherland Funeral Home (later McCammon Funeral Home), Corsicana, Texas, in Navarro Leaves and Branches, vol. IV, no. 4 (Nov 1981), p. 18A. [S153] Navarro County Cemetery Records, vol. 3 (Corsicana, Tex. : The Navarro County Gen. Soc'y, 1984), p. 22 (year only). [S1207] Corsicana Daily Sun, Corsicana, Tex., online archive, above, 14 May 1915, p. 4, col. 5 (obituary of Capt. B. F. Lisman) (stating that he died at 2:30 a.m.). [S153] Navarro County Cemetery Records, vol. 3, above, p. 22. [S1207] Corsicana Daily Sun, Corsicana, Tex., online archive, above, 14 May 1915, p. 4, col. 5 (obituary of Capt. B. F. Lisman) (stating that he would be buried in Chatfield). [S961] Find A Grave, online, above, memorial for Benjamin Franklin Lisman, memorial no. 69614984, viewed on 25 May 2015 (not giving the date). [S1207] Corsicana Daily Sun, Corsicana, Tex., online archive, above, 14 May 1915, p. 4, col. 5. [S380] Wyvonne Putman, comp., Navarro County History (Quanah, Tex. : Nortex Press, 1975), pp. 81-82 (first bullet). [S1207] Corsicana Daily Sun, Corsicana, Tex., online archive, above, 18 Jul 1922, p. 9, col. 2, quoting from an item about Chatfield, Texas appearing in the Navarro Express, 2 Jun 1860 (second bullet). [S166] 1880 U.S. Census, Navarro County, Texas, enumeration dist. 129, p. 42, family 11 (first bullet). [S1207] Corsicana Daily Sun, Corsicana, Tex., online archive, above, 14 May 1915, p. 4, col. 5 (obituary of Capt. B. F. Lisman) (second bullet). [S380] Wyvonne Putman, comp., Navarro County History, above, pp. 81-82 (third bullet). [S1207] Corsicana Daily Sun, Corsicana, Tex., online archive, above, 14 May 1915, p. 4, col. 5 (obituary of Capt. B. F. Lisman) (third bullet). [S166] 1880 U.S. Census, Navarro County, Texas, enumeration dist. 129, p. 42, family 11 (stating that she was born in 1836 in Kentucky). [S153] Navarro County Cemetery Records, vol. 3 (Corsicana, Tex. : The Navarro County Gen. Soc'y, 1984), p. 22 (giving the year but no other information). [S961] Find A Grave, online at http://www.findagrave.com, memorial for Susan E. Hodge Lisman, memorial no. 69615012, viewed on 25 May 2015. [S67] The Dallas Morning News, Dallas, Tex., 15 Dec 1889, p. 3 (obituary of Mrs. Susan Lisman) (stating that she died at 12:15 a.m.). [S67] The Dallas Morning News, Dallas, Tex., 15 Dec 1889, p. 3 (obituary of Mrs. Susan Lisman). [S67] The Dallas Morning News, Dallas, Tex., 15 Dec 1889, p. 3. [S166] 1880 U.S. Census, Navarro County, Texas, enumeration dist. 129, p. 42, family 11. Marriage*: She married Dr. Joseph J. McGee on 20 September 1842. [S166] 1880 U.S. Census, Navarro County, Texas, enumeration dist. 129, p. 49, family 10 (John McGee household). [S197] Nancy Timmons Samuels & Barbara Roach Knox, comps., Old Northwest Texas: Historical-Statistical-Biographical, vol. 1-B, Navarro County, 1846-1860 (Ft. Worth, Tex. : Ft. Worth Gen. Soc'y, 1980), p. 510 (citing to 1850 census). [S197] Nancy Timmons Samuels & Barbara Roach Knox, comps., Old Northwest Texas, vol. 1-B, above, p. 510 (naming Eliza Ann Templeton McGee as his mother). Birth*: He was born on 6 September 1819 in Williamson County, Tennessee. Marriage*: He married Eliza Ann Templeton on 20 September 1842. Death*: He died on 30 January 1863 at age 43. [S197] Nancy Timmons Samuels & Barbara Roach Knox, comps., Old Northwest Texas: Historical-Statistical-Biographical, vol. 1-B, Navarro County, 1846-1860 (Ft. Worth, Tex. : Ft. Worth Gen. Soc'y, 1980), p. 510 (naming Dr. Joseph J. McGee as his father). Marriage*: She married Sir Robert Wynne, son of John Wynne and _____ _____. [S137] Index to Texas Delayed Probate Birth Records (Austin, Tex. : Tex. Dept. of Health, Bur. of Vital Statistics), vol. 38, p. 18587, file 607765. [S174] Bert Waters, Waco, Tex., 29 Jun 1974 interview, above (stating that he was born in 1902 in Oak Cliff). [S11] Index to Texas Death Records (Austin, Tex. : Tex. Dept. of Health, Bur. of Vital Statistics), typescript, 1981 (microfiche), p. 1947, file 97951-81. [S312] Social Security Death Index, online at http://tinyurl.com/AncestrySSDI, viewed on 6 Apr 1998 (stating that he died in Dec 1981; not naming the place of death but stating that he lived in Dallas, Texas when he died). [S67] The Dallas Morning News, Dallas, Tex., 14 Dec 1981, sec. B, p. 40 (obituary of Fleming Aiken Waters) (mentioning his church membership and his widow's name). [S174] Bert Waters, Waco, Tex., 29 Jun 1974 interview, above (stating that he was an attorney). [S923] Marriage Records, 1909-1931, Van Zandt County, Texas (Wills Point, Tex. : Van Zandt County Gen. Soc'y, 1993), pp. 84, 114 (stating that he married Annice C. Edgar on 20 Feb 1922, citing Van Zandt Co., Tex. Marriage Records, bk. 12, p. 480). Albert Bartlett ('Bert') Waters Sr.
Eastland City Cemetery, Eastland, Tex. [S58] Index to Texas Birth Records (Austin, Tex. : Tex. Dept. of Health, Bur. of Vital Statistics), typescript 1903-09, vol. 6, p. 2822, file 87804 (giving his name as Bert Waters). [S174] Bert Waters, Waco, Tex., 29 Jun 1974 interview, above (stating that he was born in 1904 in Oak Cliff, a part of Dallas). [S356] Bryan E. Couch, electronic mail to Roger Bartlett, 19 Jan 1998 (spelling her first name as Marquerite). [S11] Index to Texas Death Records (Austin, Tex. : Tex. Dept. of Health, Bur. of Vital Statistics), typescript, 1979 (microfiche), p. 1845, file 7916-79 (naming the county but not the town). [S312] Social Security Death Index, online at http://tinyurl.com/AncestrySSDI, viewed on 6 Apr 1998 (stating that he died in Jan 1979; not naming the place of death but stating that he lived in Cisco, Texas when he died). [S961] Find A Grave, online at http://www.findagrave.com, memorial for Albert Bartlett Waters, Sr., memorial no. 50970944, viewed on 13 Aug 2011 (giving the date but not the place). [S961] Find A Grave, online, above, memorial for Albert Bartlett Waters, Sr., memorial no. 50970944, viewed on 13 Aug 2011. [S356] Bryan E. Couch, electronic mail to Roger Bartlett, 19 Jan 1998 (naming Albert Bartlett Waters as her father). [S356] Bryan E. Couch, electronic mail to Roger Bartlett, 19 Jan 1998 (naming Albert Bartlett Waters as his father). Funeral services for Miss Carroll Winkler, 83, native of Corsicana, long-time El Paso teacher, were held Friday, Aug. 23, according to clippings received here from El Paso newspapers. She died in El Paso Wednesday, Aug. 21 and was buried in Evergreen cemetery. Miss Winkler, the daughter of the late C. M. Winkler, Confederate Army Colonel and judge, had resided in El Paso 61 years. She was a pioneer El Paso teacher and served 10 years as El Paso county school superintendent, the first woman to serve as county school chief, and was active in the Retired Teachers association, Delta Kappa Gamma Society, United Daughters of the Confederacy and the Harmony Chapter, Order of the Eastern Star. Miss Winkler also taught in the College of Mines and when she retired in 1950, was teaching in El Paso High School. Miss Winkler attended Salem Academy in Winston-Salem, N. C. and graduated from Sam Houston State College at Huntsville. Note*: • She was in the 1898 senior class of Corsicana High School, Corsicana, Texas. • She attended Salem Female Academy in Winston-Salem, North Carolina, taught for a while at Sam Houston State Teachers' College in Huntsville, Texas, was a reporter on the Corsicana Courier Light, and then taught at Rice, Texas. She moved to El Paso in 1902, taught history in the high school there until 1912, when she was elected county school superintendent, began teaching history at the State College of Mines and Metallurgy in El Paso in 1922, and retired in 1950. • She was a member of the United Daughters of the Confederacy and the Order of the Eastern Star. [S975] Paula Sain, message on Navarro County, Texas message board, online, http://boards.ancestry.com, 7 Jun 2004, citing 1880 U.S. Census, Navarro Co., Tex. (identifying her as female, not giving her name, and stating that she was two months old and born in Texas). [S1094] Evergreen Cemetery, El Paso, Texas, online http://www.rootsweb.com/~txelpaso/evergreen_oldList.html, (stating that she was born in 1880 without naming the place). [S1094] Evergreen Cemetery, El Paso, Texas, online, above, (not giving the date). [S1207] Corsicana Daily Sun, Corsicana, Tex., online archive at http://corsicana.newspaperarchive.com, 29 Aug 1963, p. 18, cols. 1-2 (obituary of Miss Carroll Winkler). [S1094] Evergreen Cemetery, El Paso, Texas, online, above, (stating that she died in 1963 without naming the place). [S1207] Corsicana Daily Sun, Corsicana, Tex., online archive, above, 29 Aug 1963, p. 18, cols. 1-2 (reprinted here with consent of the Corsicana Daily Sun) (giving her name as Miss Carroll Winkler). [S1274] El Paso Herald, El Paso, Tex., 3 Sep 1910, p. 21, col. 4 (in "Girls' Clubs" feature of society section). [S1207] Corsicana Daily Sun, Corsicana, Tex., online archive, above, 29 Aug 1963, p. 18, cols. 1-2 (reprinted here with consent of the Corsicana Daily Sun). [S173] Alva Taylor, "In Memoriam: Mary Carroll Winkler," above, (second and third bullet points). [S779] "Nearly One Thousand Have Graduated from Corsicana High School Since 1884," Corsicana Daily Sun, Corsicana, Tex., 10 May 1923, as reprinted in Navarro Leaves & Branches, vol. XXV, no. III (Aug 2002), p. 4 (first bullet point). [S1207] Corsicana Daily Sun, Corsicana, Tex., online archive, above, 29 Aug 1963, p. 18, cols. 1-2 (obituary of Miss Carroll Winkler) (fourth bullet point). [S455] Wyvonne Yaws Putman, "Louisa Bartlett Neil Smith Winkler," in Navarro County History, vol. 6 (Corsicana, Tex. : The Navarro County Hist. Soc'y, 1991), p. 128, (naming Clinton M. Winkler as his father). [S973] Edward L. Williams, message on Navarro County, Texas message board, online, http://boards.ancestry.com, 8 Jun 2004. [S975] Paula Sain, message on Navarro County, Texas message board, online, http://boards.ancestry.com, 7 Jun 2004, citing 1880 U.S. Census, Navarro Co., Tex. [S7] Navarro County, Texas Marriages, vol. 1, 1846-1888 (Corsicana, Tex. : The Navarro County Gen. Soc'y, 1987), p. 101 (citing Navarro County, Texas Marriage Records, vol. V, p. 500). [S975] Paula Sain, message on Navarro County, Texas message board, online, http://boards.ancestry.com, 7 Jun 2004, citing 1910 U.S. Census, Ellis Co., Tex. (stating that they had been married two years). [S173] Alva Taylor, "In Memoriam: Myra Carroll Winkler," Navarro County Scroll, 1963, n.p., (stating that he was born in Corsicana, Texas). [S975] Paula Sain, message on Navarro County, Texas message board, online, http://boards.ancestry.com, 7 Jun 2004, citing 1900 U.S. Census, Ellis Co., Tex. (stating that he was widowed, living in Ennis, Texas, and employed by a railroad). [S975] Paula Sain, message on Navarro County, Texas message board, online, http://boards.ancestry.com, 7 Jun 2004, citing 1910 U.S. Census, Ellis Co., Tex. [S961] Find A Grave, online at http://www.findagrave.com, memorial for Walton Conrad Winkler, memorial no. 115414464, viewed on 20 Aug 2013 (naming Judge Clinton M. Winkler as his father). [S961] Find A Grave, online, above, memorial for Walton Conrad Winkler, memorial no. 115414464, viewed on 20 Aug 2013 (naming Angelina Virginia Smith as his mother). [S961] Find A Grave, online, above, memorial for Walton Conrad Winkler, memorial no. 115414464, viewed on 20 Aug 2013. [S173] Alva Taylor, "In Memoriam: Myra Carroll Winkler," Navarro County Scroll, 1963, n.p., (stating that he was born in Corsicana, Texas without giving the date). [S973] Edward L. Williams, message on Navarro County, Texas message board, online, http://boards.ancestry.com, 8 Jun 2004, (stating that he was born in 1869 without naming the place). [S975] Paula Sain, message on Navarro County, Texas message board, online, http://boards.ancestry.com, 7 Jun 2004, citing 1880 U.S. Census, Navarro Co., Tex. (stating that he was born in 1869 in Texas). [S975] Paula Sain, message on Navarro County, Texas message board, online, http://boards.ancestry.com, 7 Jun 2004, citing 1900 U.S. Census, Ellis Co., Tex. [S961] Find A Grave, online at http://www.findagrave.com, memorial for Beatrice Elizabeth Winkler Markgraff, memorial no. 115413834, viewed on 20 Aug 2013 (naming Clinton C. Winkler as her father). [S961] Find A Grave, online, above, memorial for Beatrice Elizabeth Winkler Markgraff, memorial no. 115413834, viewed on 20 Aug 2013 (naming Angelina Virginia Smith as her mother). [S173] Alva Taylor, "In Memoriam: Myra Carroll Winkler," Navarro County Scroll, 1963, n.p., (stating that she was born in Corsicana, Texas without giving the date). [S973] Edward L. Williams, message on Navarro County, Texas message board, online, http://boards.ancestry.com, 8 Jun 2004, (stating that she was born in 1871 without naming the place). [S975] Paula Sain, message on Navarro County, Texas message board, online, http://boards.ancestry.com, 7 Jun 2004, citing 1880 U.S. Census, Navarro Co., Tex. (stating that she was born in 1871 in Texas). [S961] Find A Grave, online, above, memorial for Beatrice Elizabeth Winkler Markgraff, memorial no. 115413834, viewed on 20 Aug 2013. [S975] Paula Sain, message on Navarro County, Texas message board, online, http://boards.ancestry.com, 7 Jun 2004, (naming Beatrice E. Winkler as her mother). [S961] Find A Grave, online, above, memorial for Augusta Markgraff Belden, memorial no. 115049521, viewed on 20 Aug 2013 (naming Beatrice Elizabeth Winkler as her mother). [S189] Navarro County Cemetery Records, vol. 9 (Corsicana, Tex. : The Navarro County Gen. Soc'y, 1989), p. 3 (naming Beatrice Markgraff as his mother). [S961] Find A Grave, online, above, memorial for Ermengarde Markgraff, memorial no. 115414362, viewed on 20 Aug 2013 (naming Beatrice Elizabeth Winkler as her mother). [S189] Navarro County Cemetery Records, vol. 9 (Corsicana, Tex. : The Navarro County Gen. Soc'y, 1989), p. 107. [S189] Navarro County Cemetery Records, vol. 9, above, p. 107 (identifying her as "wife of C. M. Winkler, Jr."). [S356] Bryan E. Couch, electronic mail to Roger Bartlett, 19 Jan 1998 (giving his name as Royce Everett Waters). [S67] The Dallas Morning News, Dallas, Tex., 28 Mar 1971, sec. A, p. 28 (obituary of Marion A. Waters) (giving his name as Royse Waters). [S174] Bert Waters, Waco, Tex., 29 Jun 1974 interview, above (stating that he resided with brother Fleming Waters).